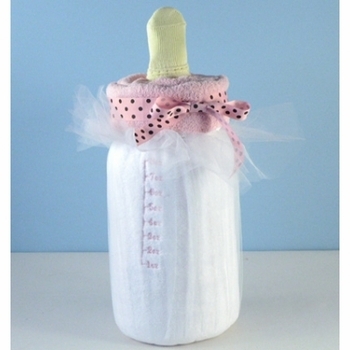 This cute and clever 2 foot tall baby bottle is actually a soft as can be "milky fabric" blanket! Available in pink and blue or yellow if baby's gender is still a surprise. All items are of the highest quality and made in the USA. Packed with other necessities tucked inside, it is a truly unique shower gift! The blanket is luxuriously minky soft and sure to become a favorite! This set is also delivered fully gift wrapped!